Advance your Project Management Office (PMO) to the next level with a secure, cloud-based Project Portfolio Management (PPM) solution. Planview PPM Pro (formerly Innotas) makes it easy to collect, prioritize, and execute projects, helping PMO teams focus resources on the work that delivers the most value. Learn how to help PMO teams focus resources on the work that delivers the most value. PPM Pro delivers an end-to-end solution for managing your PMO operations – from managing demand intake to reporting on portfolio performance and everything in between. 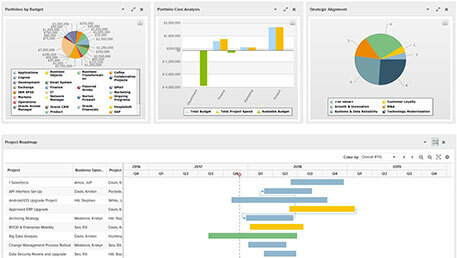 Learn more about all the project portfolio management capabilities delivered by PPM Pro (formerly Innotas). Gartner has named Planview a Leader in the May 2018 Gartner “Magic Quadrant for Project Portfolio Management, Worldwide” for its ability to execute and completeness of vision. Innotas was acquired by Planview in 2016 to significantly advance its cloud-based IT Project Portfolio Management (PPM) offering for new and maturing PMOs. Innotas is a registered trademark of Planview, Inc.